Research Interests: Unsteady aerodynamics, structural dynamics, and aeroelasticity of turbomachinery and aerospace vehicles. Novel approaches to modelling complex physical phenomena using computational fluid dynamics. Optimization and sensitivity analysis. Optimal aerodynamics of flight vehicles and animal propulsion. Unsteady aerodynamics, structural dynamics, and aeroelasticity of turbomachinery and aerospace vehicles. Novel approaches to modeling complex physical phenomena using computational fluid dynamics. Optimization and sensitivity analysis. Fluid dynamics of animal propulsion. 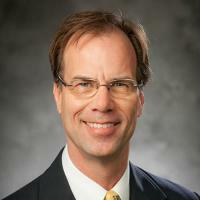 2007 - Present: Professor, Duke University, Durham, NC Department of Mechanical Engineering and Materials Science. 2001 - 2007: Professor and Chair, Duke University, Durham, NC Department of Mechanical Engineering and Materials Science. 2000 - 2001: Professor, Duke University, Durham, NC Department of Mechanical Engineering and Materials Science. 1997 - 1998: Visiting Associate Professor, Massachusetts Institute of Technology, Cambridge, MA. Department of Aeronautics and Astronautics. 1996 - 2000: Associate Professor, Duke University, Durham, NC Department of Mechanical Engineering and Materials Science. 1990 - 1996: Assistant Professor, Duke University , Durham, NC Department of Mechanical Engineering and Materials Science . 1987 - 1990: Associate Research Engineer, United Technologies Research Center , East Hartford, CT.
IGTI Structures & Dynamics Committee Best Paper Award for "A Coupled Mode Analysis of Unsteady Multistage Flows in Turbomachinery," by Silkowski, P. D., and Hall, K. C., ASME Paper 97-GT-186, presented at the 42nd ASME International Gas Turbine and Aeroengine Congress & Exposition, Orlando, FL, June 2­-5, 1997. ASME Best Paper Award for "A Viscous-Inviscid Model of Unsteady Small Disturbance Flows in Cascades," by Cizmas, P. G. A., and Hall, K. C., AIAA Paper 95-2655, presented at the 31st AIAA/ASME/SAE/ASEE Joint Propulsion Conference, San Diego, CA, July 10-12, 1995. Lilly Foundation Teaching Fellowship, 1992-1993. American co-winner of the Dr. Ernst Zimmermann Memorial Award, 1986, awarded to investigators under the age of 30 for contributions in the field of propulsion technology. Fannie and John Hertz Foundation Fellow, 1982-1987. Tau Beta Pi, Massachusetts Beta Chapter. Chairman of the ASME International Gas Turbine Institute (IGTI) Structures & Dynamics Technical Committee (2000-2002). Member of the ASME/IGTI Turbomachinery Technical Committee. Reviewer for numerous journals, including the ASME Journal of Turbomachinery, AIAA Journal, Journal of Fluid and Structures, and Journal of Computational Physics. Host of the Tenth International Symposium on Unsteady Aerodynamics, Aeroacoustics, and Aeroelasticy to be held at Duke University in 2003.